Not all has gone to plan so far for this year’s World Cup hosts. A poor showing in their opening game against Croatia was rescued in large part by some suspect officiating decisions and poor goalkeeping and some of the same problems that have hampered them previously. Luiz Felipe Scolari made one change to his eleven, as the more defensive Ramires came in for the wide forward Hulk, while Mexico remained unchanged from the team that beat Cameroon comfortably. 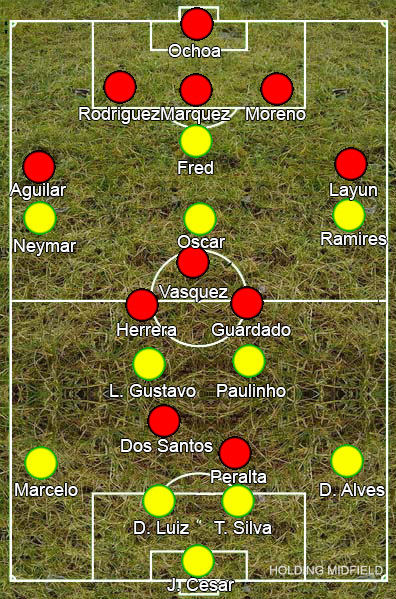 The Mexican use of wing-backs meant Marcelo and Dani Alves were free to venture forward to greater effect than in the tournament opener, and Miguel Layun and Paul Aguilar were less influential than they had been against Cameroon, but otherwise Brazil remained a disappointment. Their play was slow as Luis Gustavo and Paulinho continued to offer little going forward. The use of Ramires was presumably to curtail Layun’s attacking but only added another unimaginative midfielder into the mix, and it was a relief when he was replaced by Bernard. The team is eerily reminiscent of Dunga’s side of four years ago, which was more impressive despite its more limited resources. That primarily counter-attacking side eventually failed due to its lack of attacking options, and Lucas Moura, Philippe Coutinho, Roberto Firmino, Kaka, Robinho and Ronaldinho must have all wanted to turn over when Jo entered the fray tonight. By contrast, Mexico again looked excellent despite featuring few household names. They tracked the Brazilians closely, pressing intermittently at a heavy touch, and both Rafa Marquez and Hector Moreno stepped out of the backline to great effect. When they had possession, they showed great confidence on the ball and moved about the pitch intelligently. Set-pieces remained a major issue for Mexico defensively however, and it was Guillermo Ochoa’s commanding presence in goal that saved them on more than one occasion. As the game wore on, it opened up further as players tired and Brazil got more players forward in search of a goal, resulting in a great end-to-end finish. Nevertheless, at full-time, things remain the same: Brazil still aren’t creative enough in key areas, while Mexico edged closer to qualifying from the group with another impressive performance.